The 540 series is well suited for residential use. Utilizing commercial grade copper alloy for the heat exchanger tubing, the 540 series is also suitable for heavier-residential usages such as domestic recirculation systems. Remote control included as a standard feature on all Outdoor models. Indoor models are certified up to 10,100 ft. altitude. Provides a variety of installation options: outdoor and direct vent. Complies with Ultra-Low NOx regulations and meets the energy efficiency requirements. Easy-Link System capable up to 4 units. 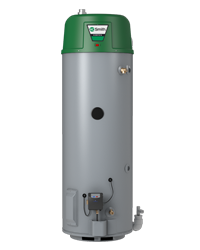 The ATI-540H-N tankless water heater uses up to 199,000 BTU/hr of natural gas to deliver an endless supply of hot water for a 3 bath home in northern climates and up to a 4 bath home in southern climates (one shower head per bath). Utilizing condensing technology, this heater is extremely efficient with a Uniform Energy Factor of 0.93. 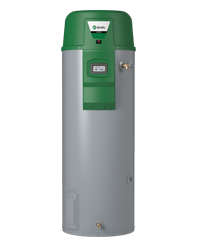 With an industry leading 15-year limited warranty, the ATI-540H-N tankless water heater provides years of hot water through innovation and quality. A. O. Smith tankless water heaters take up much less space that your conventional tank-style water heater. With no tank to steal valuable storage space, our wall-mount design allows for additional storage and flexibility. The comprehensive line of A. O. Smith tankless water heaters are an excellent whole-home water heating solution that supply endless hot water. The comprehensive line of A. O. Smith tankless water heaters provide hot water on-demand. When it comes to high efficiency tankless water heaters, no one comes close to matching the expertise and innovation of A. O. Smith. With higher efficiency ratings and groundbreaking designs, our tankless water heaters feature non-condensing and condensing technology and are part of a new era in water heating.